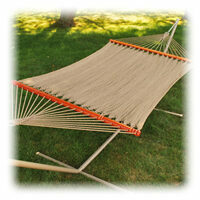 Everyone agrees that the end result of choosing a Hammock is extreme relaxation and blissful comfort. Choosing the best hammock for your needs and locations helps get you to that relaxing state faster, and keeps you there longer. We find that often shoppers do not realize that hammocks are designed differently for much more than appearance - the very construction of a hammock is based on the intended use! In the page below we have compiled information all about hammocks and hammock chairs to help you choose the best option for your location and intended use! As mentioned above, hammock construction is based on the intended use. For instance, quilted hammocks are great for people in cooler climates, or wishing to relax outdoors through autumn and early spring, but if you try and use a quilted hammock during a Georgia summer, you will be hot and uncomfortable! Likewise, if you attempt to use a rope hammock during Labor Day in north Montana, you will be cold and stiff. Read more about the different styles avaialble, then choose the best hammock to suit your lifestyle! 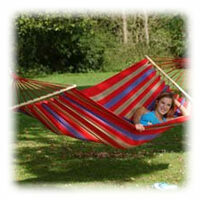 Designed for warm and hot climates, a rope hammock is made of cotton or polyester and has a light weave for relaxation. Camping hammocks are lightweight and work like tents to keep campers off the ground. Sleep in a camping hammock for versatility. Fabric hammocks are durable and great for colder climates. 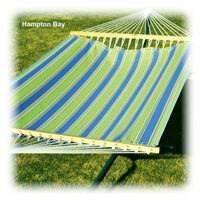 Decorate the yard with a solid or striped pattern fabric hammock. 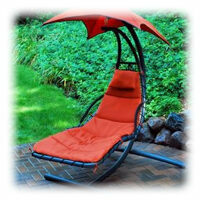 Curl up in a single person hammock chair or hammock swing and enjoy a good book or the light summer breeze. Rope hammocks are designed for use in warm and hot climates. Airflow is not constricted at all, allowing you and your clothing to breathe. Cotton rope hammocks are considered more comfortable than polyester rope hammocks, but cotton will not last as long as polyester. Cotton as a material is subject to mildew and will deteriorate if left in direct sunlight. Cotton rope hammocks are great for indoors, but will offer a shorter life if used outdoors. 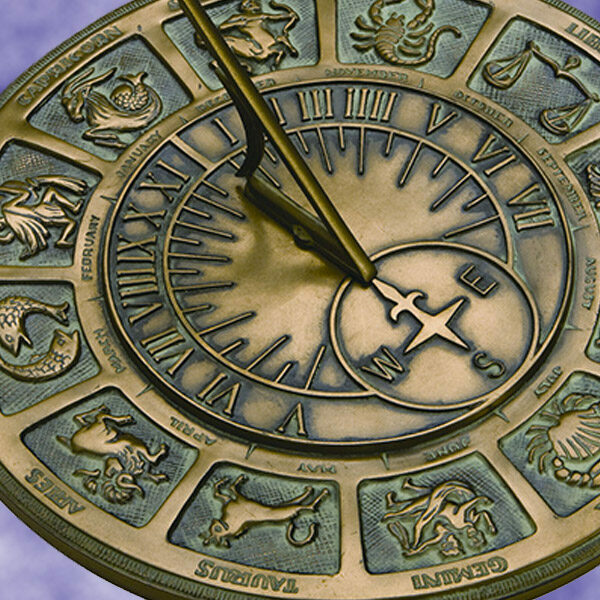 Polyester is more durable, and is not susceptible to mold, mildew, or fading. 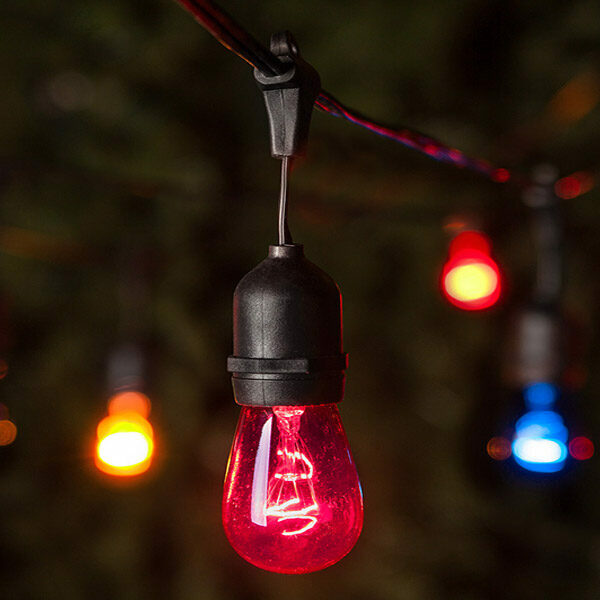 Polyester rope hammocks will last many years and require little maintenance. DuraCord rope hammocks are durable like polyester, yet soft as cotton. 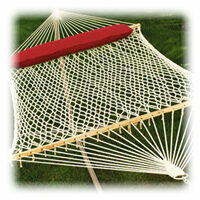 Rope hammocks are available in many colors, ranging from traditional white hammocks to reds, greens, and tans. 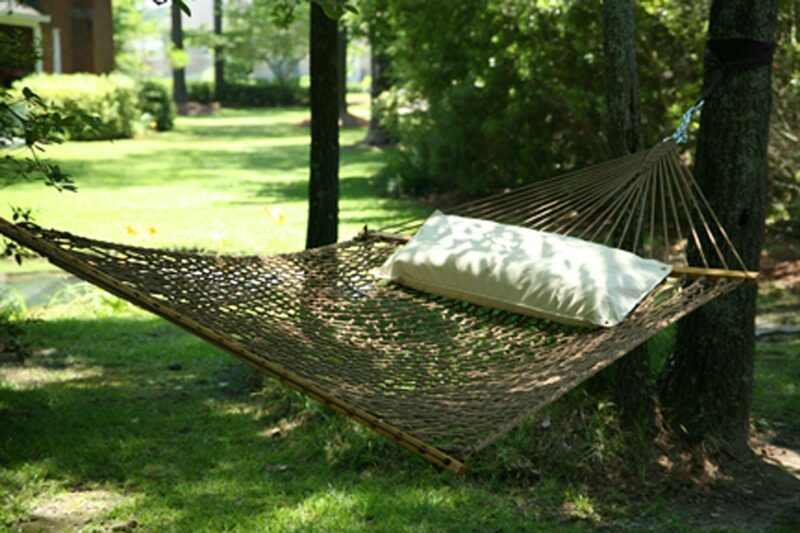 Fabric hammocks are great for cooler climates and seasons. 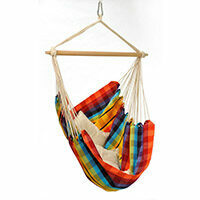 Fabric hammocks are also the leader in comfort, inviting owners to long afternoon naps and lazy Sundays. Fabric hammocks are available in a large variety of fabric patterns and solid colors, allowing for individuality and fun. Fabric hammocks do not allow as much airflow as rope hammocks, so wrap yourself up in a bed-like hammock and close your eyes and dream! For much cooler climates and windy locations, quilted fabric hammocks offer a thick lining to prevent any airflow, and retain body heat. The decision to purchase a hammock with or without a spreader bars is a matter of preference. Spreader bars are the bars located at the head and foot of a hammock bed, and its main purpose is to prevent the hammock from snuggling you like a cocoon. Children should never be left unattended in or near a hammock, but hammocks without spreader bars are especially dangerous since children often find it difficult to get out. 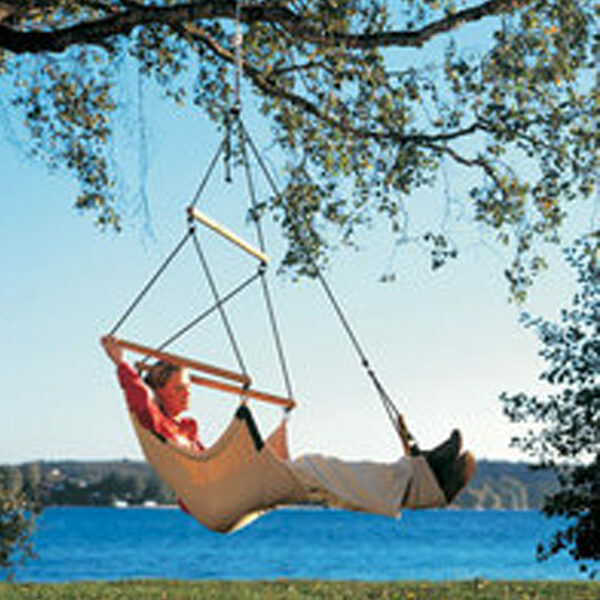 Hammocks without spreader bars also offer greater flexibility in hanging distances, as well as hanging height. Most rope and fabric hammocks hold an average of 275 lbs, while many offer enough room for 2 or more people to lie together, with weight limits up to 450 lbs! Family hammocks and 2-person hammocks offer luxury and comfort that can be shared with loved ones and friends. Hammocks can be hung indoors and outdoors, from trees, posts, decks, and more. Hammock Chairs and Hammock Swings are great for people who just want to sit and relax, but are not interested in lying down. 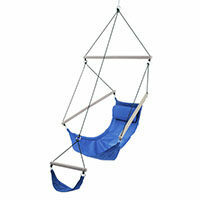 Hammock chairs and swings often come with foot rests, and they can be used indoors or outdoors. Hammock chairs are great for reading and studying, or just swinging and chatting on the phone with friends. Camping hammocks are lightweight and designed for quick assembly and removal. Camping hammocks are ideal to take camping, on day trips, vacations, and more. Often weighing approximately 1 lb, camping hammocks pack down into small travel sizes and are durable enough to use time and again. Camping hammocks keep you and your feet off the ground, and protect you from rain and insects. Travel to your next destination with the promise of rest and relaxation in a camping hammock. If you are convinced you need a hammock but just can't find the proper location to hang your hammock, you need a hammock stand. 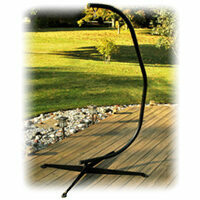 Hammock stands allow you to erect a hammock in any location, and can be moved as needed. 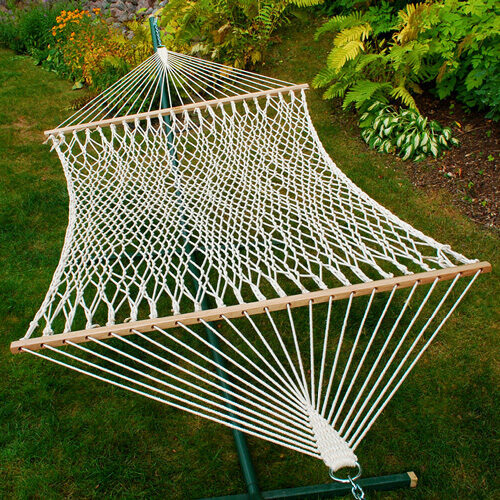 Hammock stands are available in wood or metal. Wooden hammock stands are popular for their attractive natural looks and while they are not as easy to move around, they are very stable. 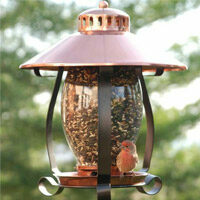 Metal hammock stands are easy to assemble and lightweight, making them easier to move around. Metal hammock stands are often painted with a powder coat finish so they will not rust, and any scratches can be touched up with paint. We even offer packages that include hammocks with stands, so you can get everything you need at once.